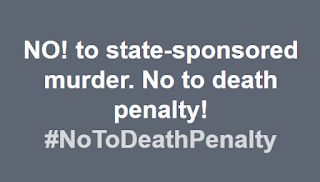 As I grow older, my patience for violence, especially state-sponsored or state-inspired murders, goes down to zero. 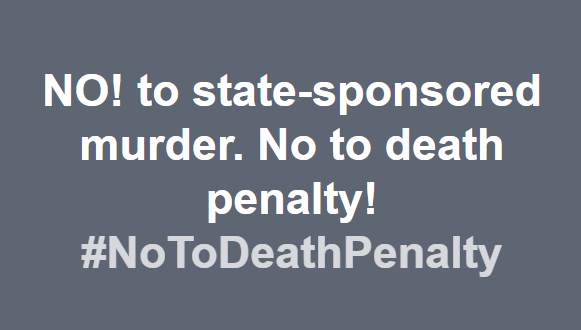 Many state bureaucrats and officials are lousy at enforcing the rule of law even for minor offenses, so how can they be trusted to enforce death penalty to all, rich and poor convicts? 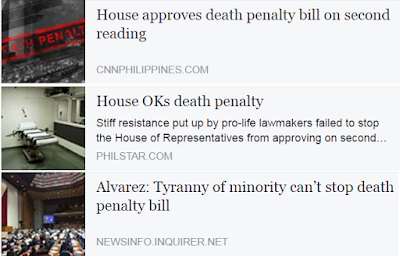 The death penalty bill has passed on 2nd reading at the PH House of Representatives the other day. “The entire process moved very fast — taking only 30 seconds from the closure of the period of amendments to the passage on second reading. One possible reason why the Congressmen/women rushed the passing of this evil bill is that the legislators are cooking something more sinister and the death penalty is a good cover to divert the people's attention. The legislators and Pres. Du30 want to institutionalize state-sponsored murders. Masakit pakinggan ang EJK, masarap naman pakinggan (sa tenga nila) ang LJK (legal judicial killing). The plunderers of today and the future want to "feel good" that drug offenders will easily die while they do large-scale stealing and extortion. In a society with weak rule of law culture and practice, majority of those convicted are poor and it's also them who will easily go to the death chamber. One more reason why BIG government is wrong and evil.